1. 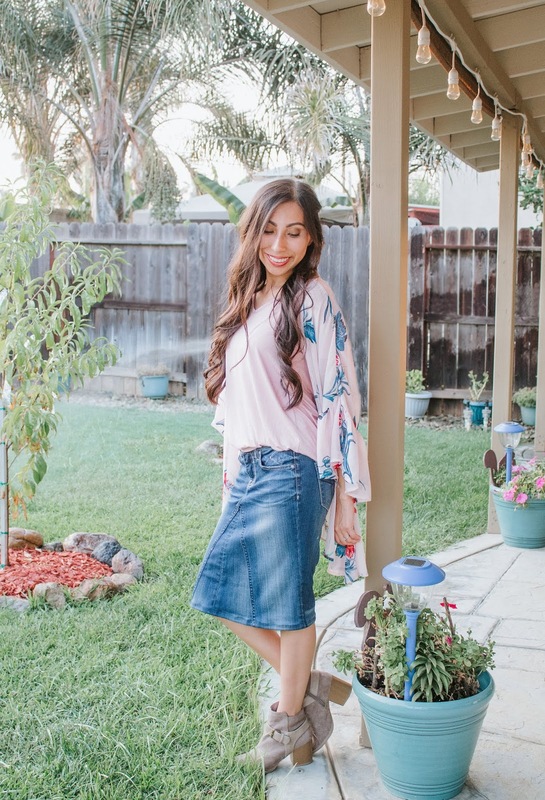 Start out with a skirt that fits you well, and mark about 2-3 inches below it on the pant legs. 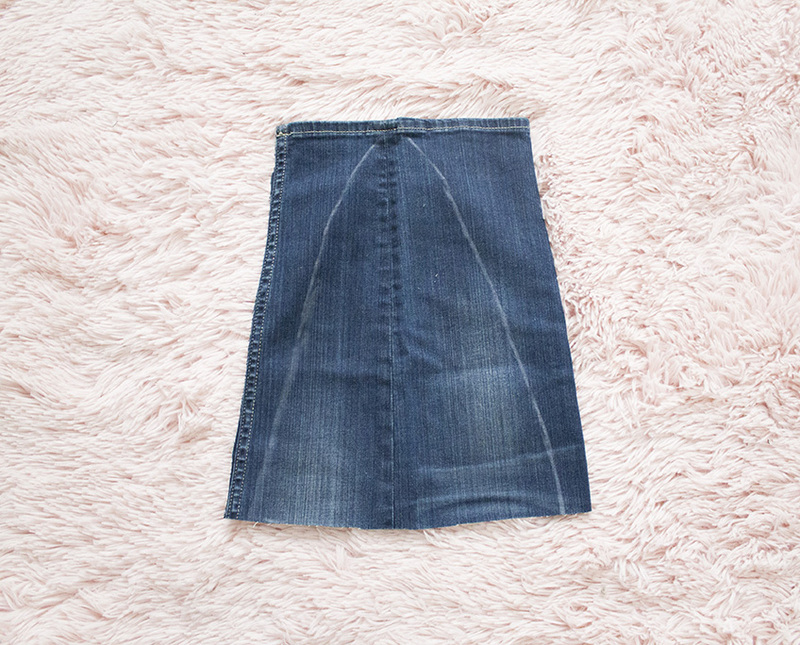 It's okay if it's a little longer than your desired skirt length, you can always go back and cut it when doing the final hemming. I like to have extra room to work with, rather than have it be too short. 2. Cut off the pant legs at the mark. 3. 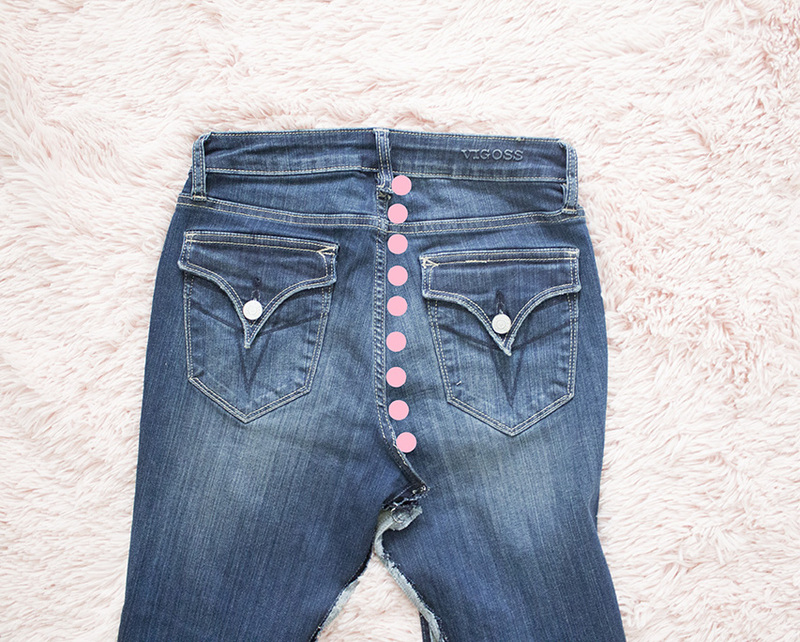 Grab a seam ripped and rip out the entire crotch seam, as shown by the pink dots. I like to seam rip until I hit the zipper. 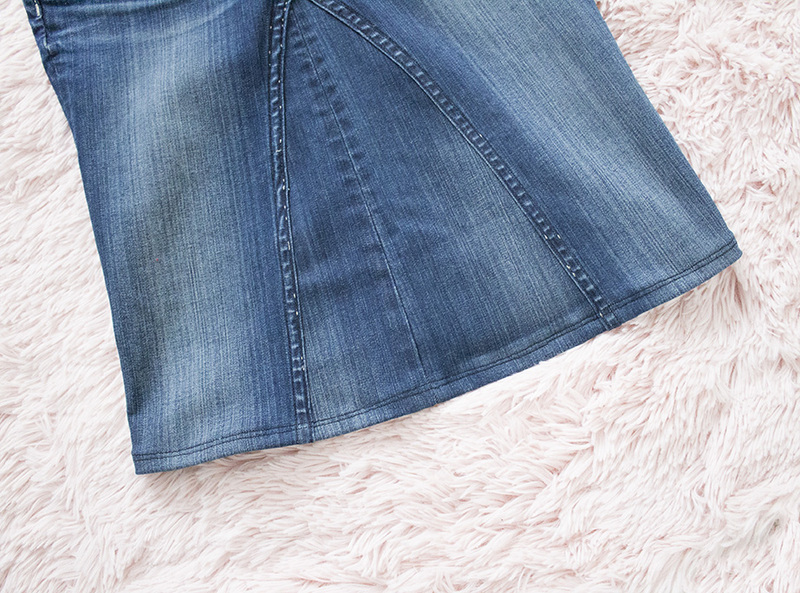 Now, here is where you are doing to decide which method to use when making your skirt. I'm sorry, I couldn't think of cooler-not-so-basic names for the methods! 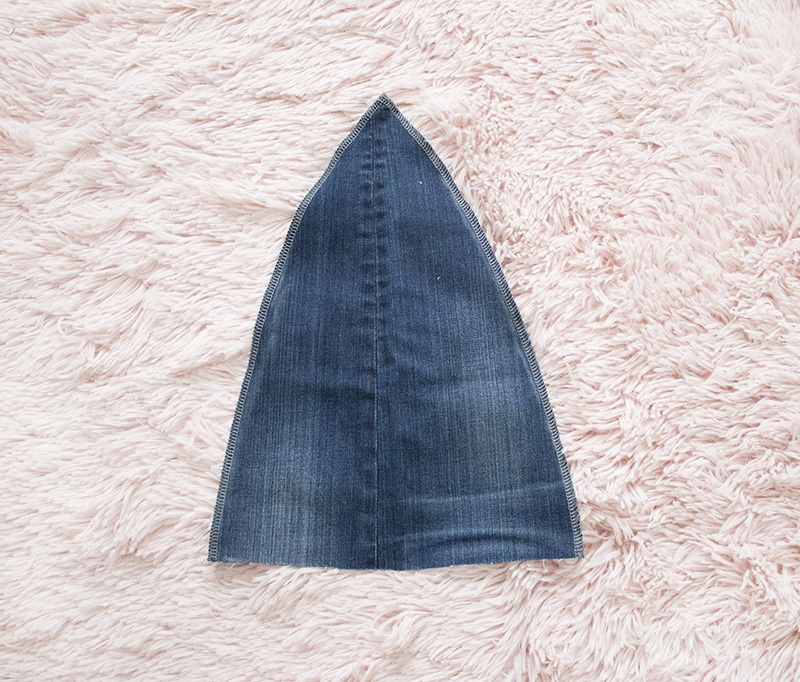 The first method: You will use two triangle inserts for your skirt, one in the front and one in the back. 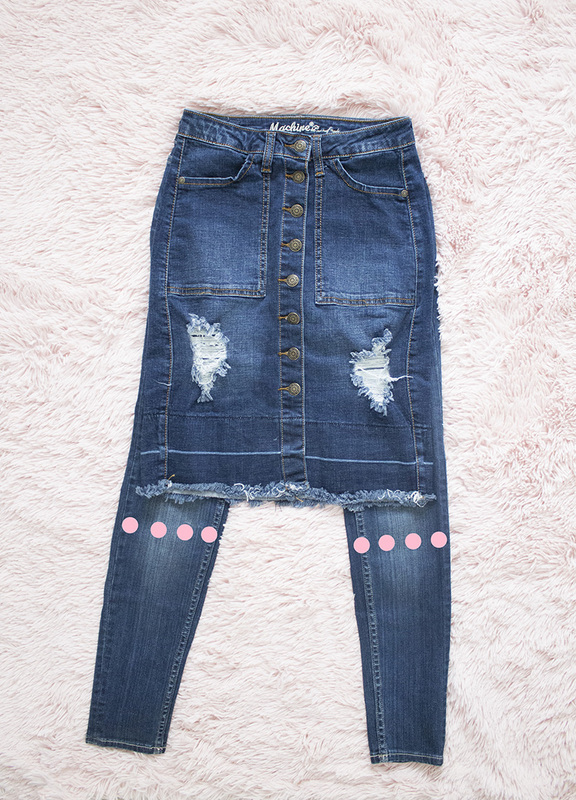 I recommend this method if your jeans are tighter to start with, or if you'd like a little bit more room in your skirt. 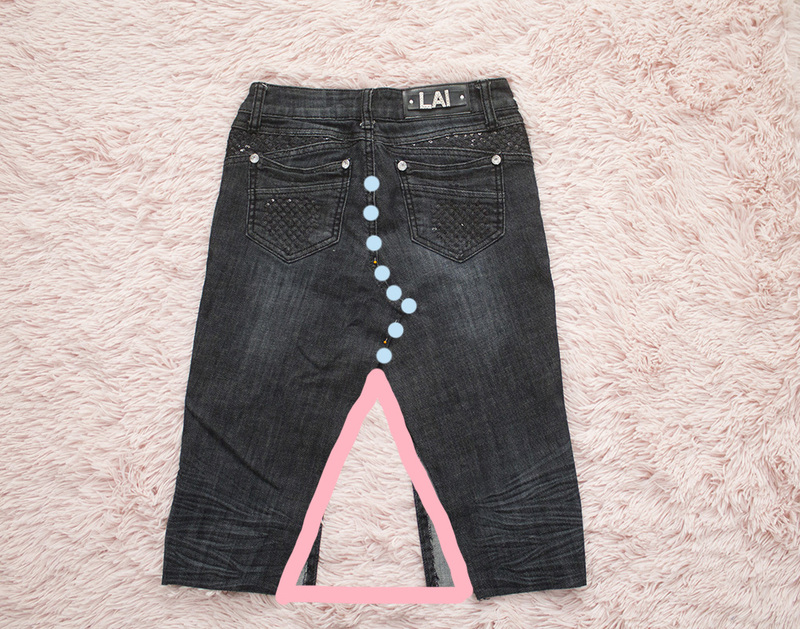 The second method: You will only use one triangle insert, on the front of the skirt only. The back will be entirely closed. 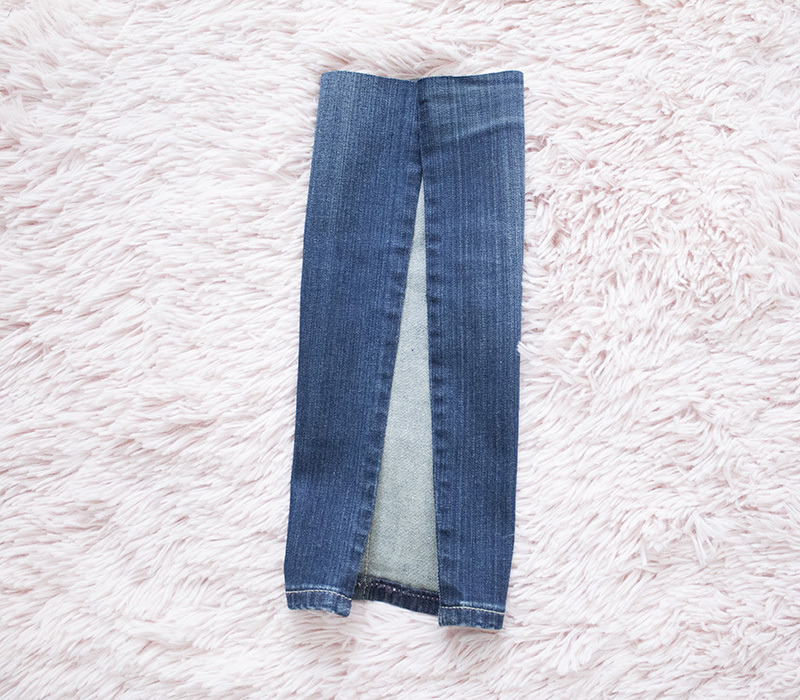 I recommend this method if your jeans are not too tight to start with, or if you'd like a tighter/more "pencil" fit. 4. Seam rip up the back about a little higher than midway around the pocket area. It doesn't have to be exact, just don't seam rip all the way to the top. 5. 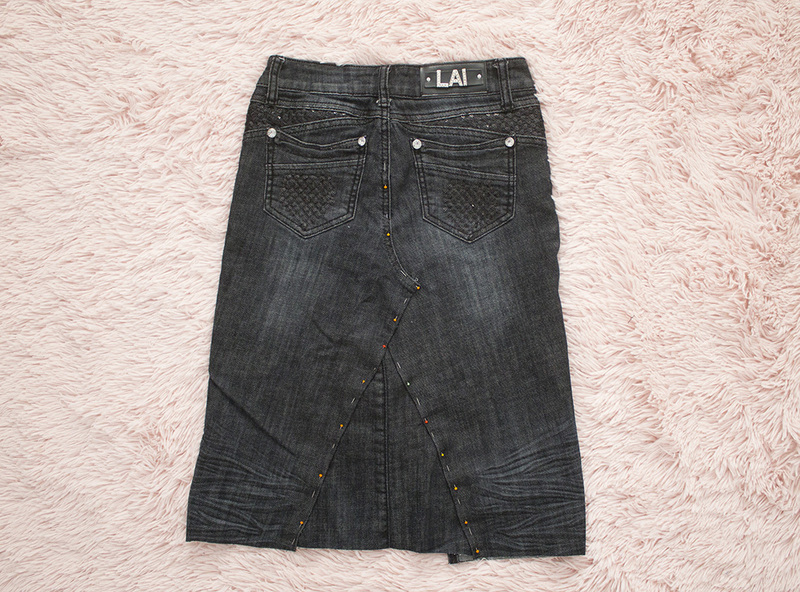 Next, lay your soon-to-be skirt flat, with the back pieces overlapping, as shown below. Pin this part, so nothing moves (shown with the blue dots). 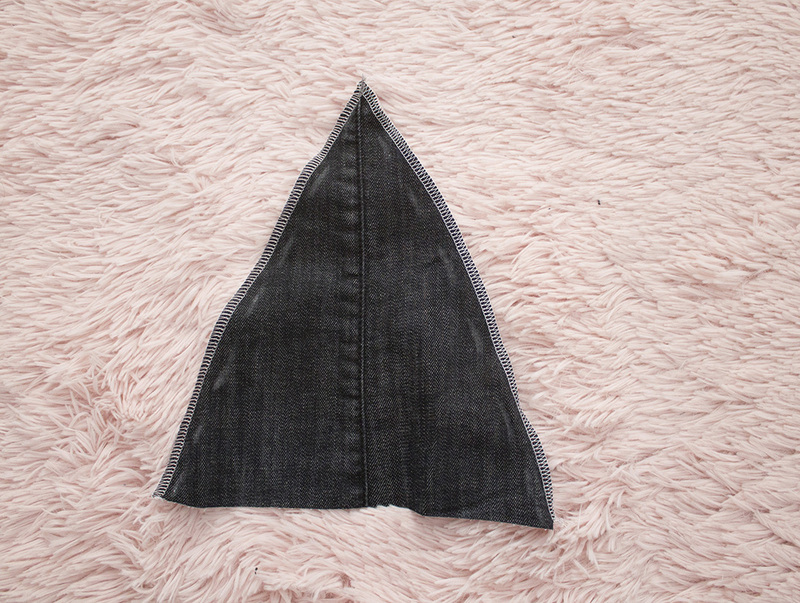 The pink triangle is where you're going to sew in a denim triangle. 6. 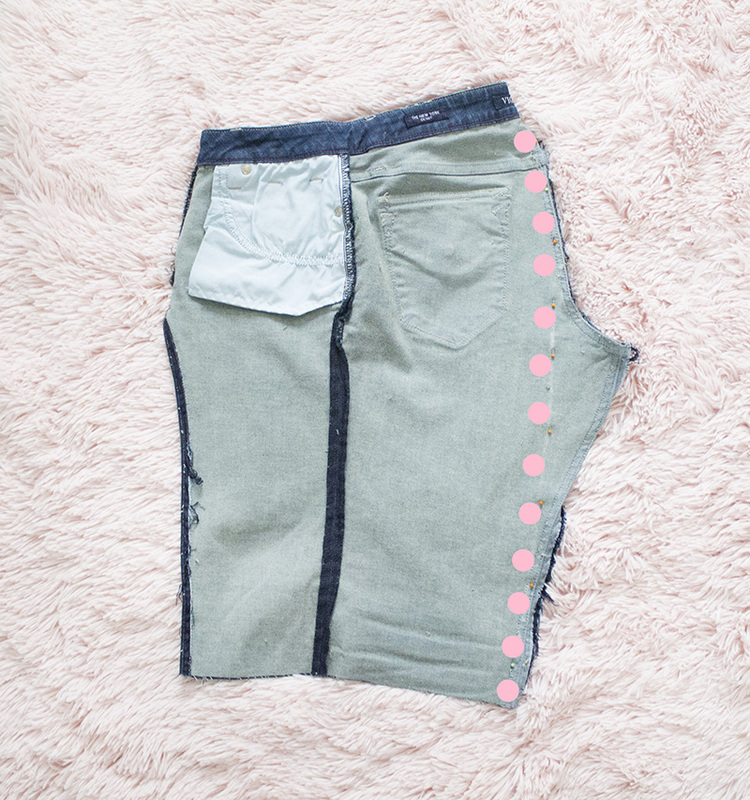 Using the pant leg pieces you cut off in Step 2, slide a piece underneath the overlapping pieces. Trace around, and slide out the piece. 7. Cut out the piece with extra seam allowance around it, to allow space for it to be sewn. 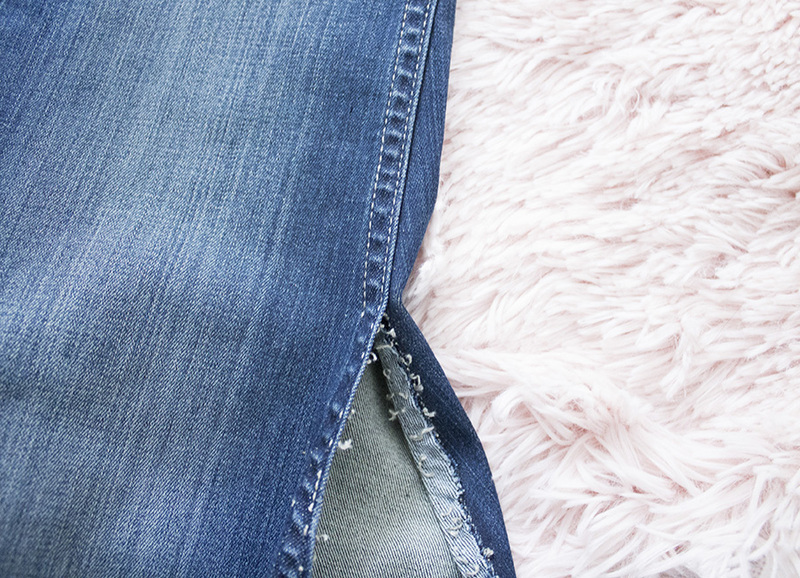 Finish the edges with a serger or a zig zag stitch. 8. Then, pin the triangle piece in place and topstitch. 9. 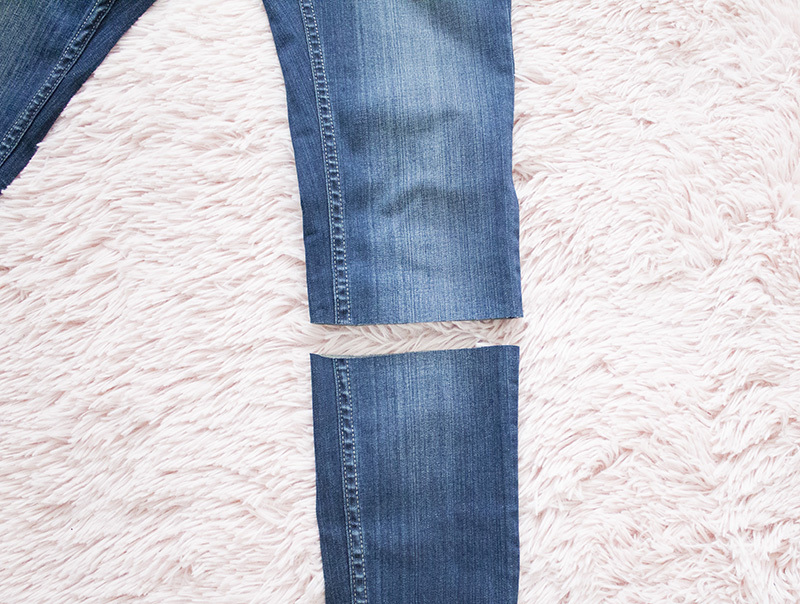 Seam rip the belt loop at the center back of your soon-to-be skirt. 10. 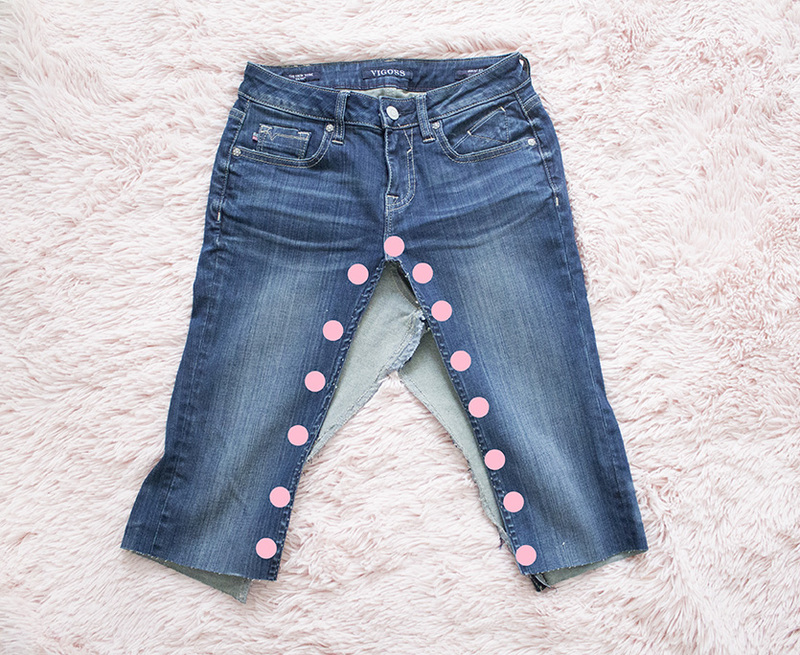 Next, seam rip all the way up, as shown by the pink dots. 11. 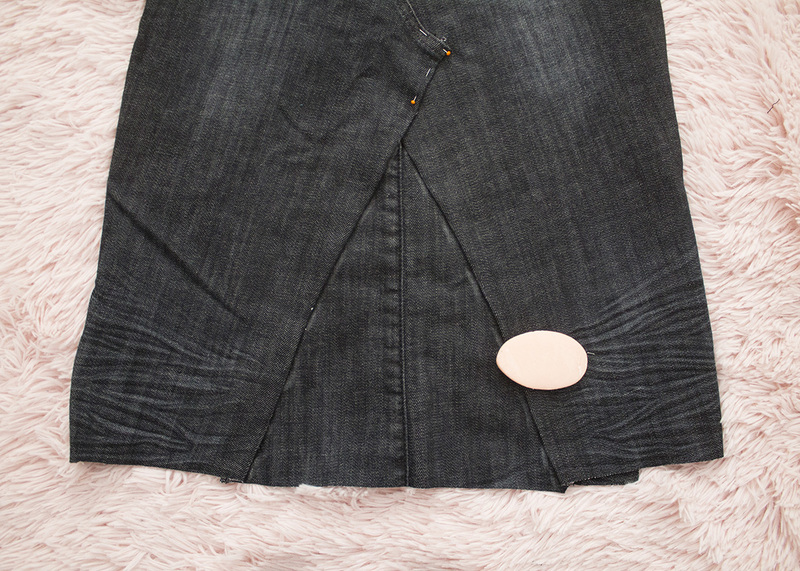 This part takes a little bit of pinning, turning the skirt inside out, and patience. Pin a nice slightly curved (at the top) line. 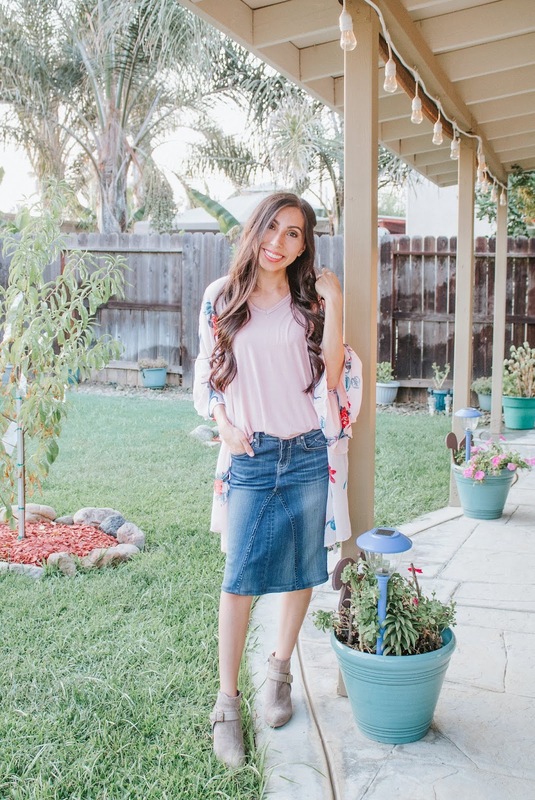 I usually pin, then turn my skirt inside out, and try it on to see if the back fits smoothly. 12. 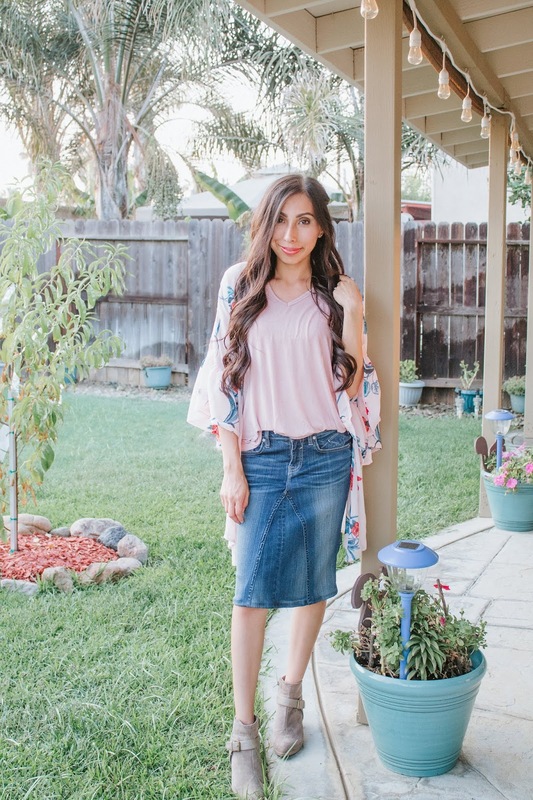 Using a pant leg piece, you're going to sew the front triangle piece. 13. 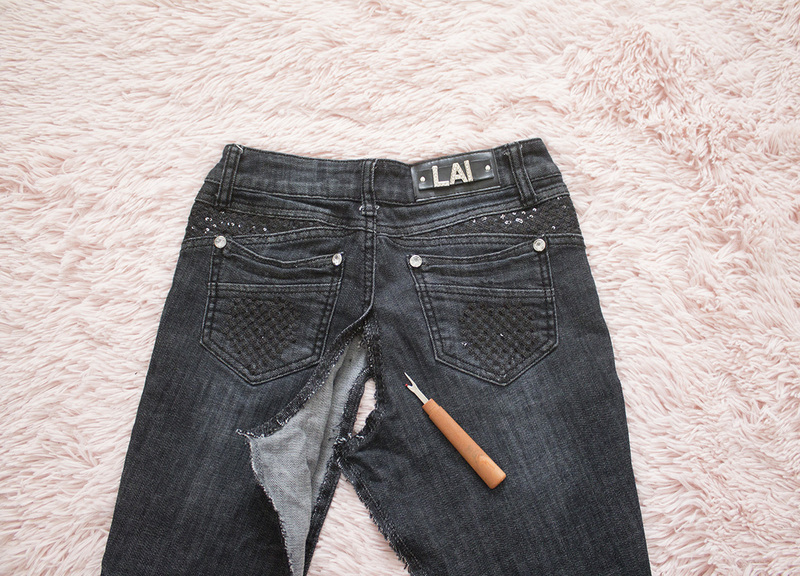 Lay your skirt flat and insert the leg piece underneath the front side of skirt. 14. Much like Step 6-7, trace the triangle piece with seam allowance around it. I don't measure how much exactly, just enough to serge and sew. 16 ...And serge or zig zag stitch around it. 17. Pin the triangle piece underneath the front side of the skirt and topstitch. 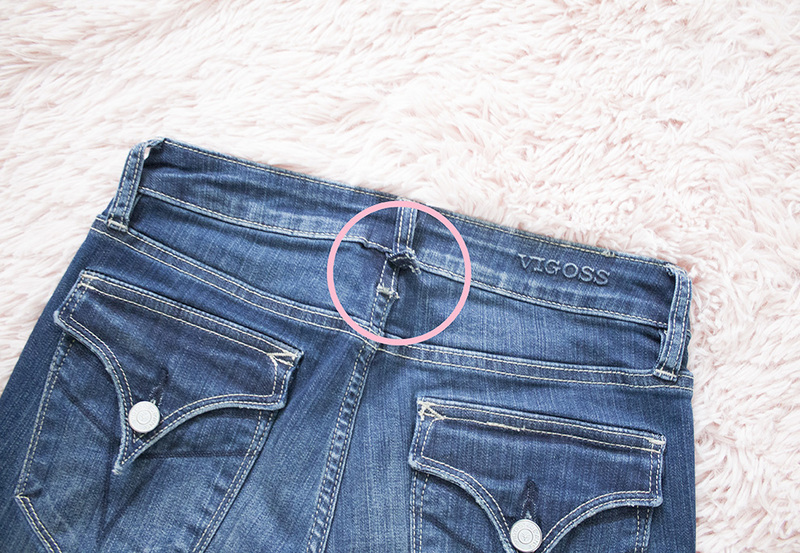 Move the little piece that's circled to the left, making sure it's laying flat. 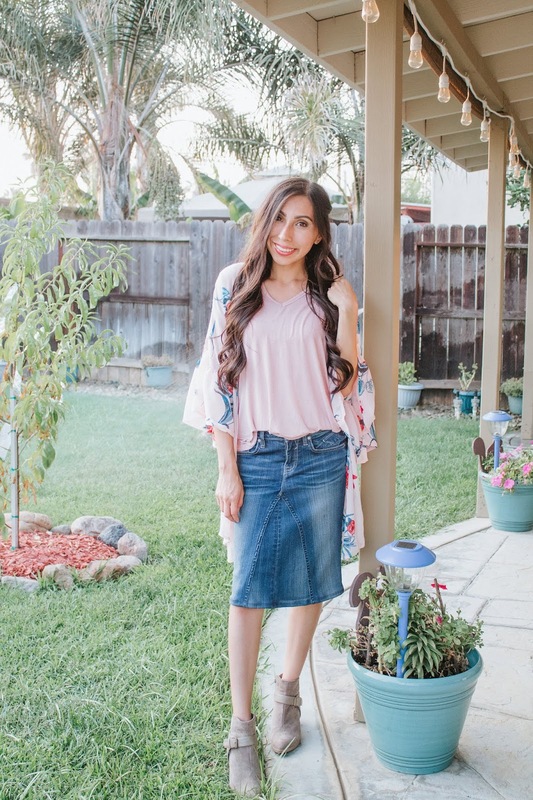 Now enjoy your new denim skirt!